We have compiled a list of what we find to be the most interesting and informative music blogs on the web. The list amounts to 21 music blogs, but is divided into four categories; Music Blogs (general reviews of up-and-coming music), International Blogs (reviews up-and-coming music from specific countries and around the world), Entertainment Blogs (covers news and reviews of a variety of art forms), and Music Industry Blogs (covers the latest happenings of what is moving and shaking in the music industry). The Hype Machine: Accumulates all of the best music blogs across the web into one easy to read space. What’s not to love? Hype Machine does all the work for you. Blog posts consist of music reviews and music previews and can be divided into several categories, Latest (what’s going on right now in the blogosphere), Popular (the most popular artists, searches and blogs on the net), Twitter (interactive music chart of songs being posted on Twitter), Radio (an eclectic non-stop radio stream of blogged tracks from the past week), Spy (allows you to snoop on what other people are listening to on hypem.com), and Zeitgeist (the best 50 artists, albums and songs of the year). I Guess I’m Floating: is a great place to preview what is new and worthwhile in the indie music scene. We stumbled onto this blog after being referred by The Pop Cop’s, Music Alliance Pact, which accumulates some of the best music blogs from around the world. As promoters for SXSW 2009 and 2010, IGIF provided excellent video and news coverage of bands to keep an eye on in the near future. Check out the separate tab in their blog strictly devoted to SXSW. Live Music Blog: Honestly, their name says it all. A website dedicated to covering the best live music from concerts to music festivals across a variety of music genres. They feature a blog, podcasts and music news, about jambands, indie rockers, electronica and generally anything experimental. They try to avoid anything mainstream and spend most of their web space discussing who can really play a good set. Music For Kids Who Can’t Read Good: MusicForAnts.com is a great place to read reviews and sample the latest tunes that new music has to offer. Generally directed towards an audience with a more indie, rock and roll ear, but somehow manages to integrate a lot of really, really ridiculously good looking lines from Zoolander. Elbo.ws: Anything and everything “hot” in entertainment can be found on Elbo.ws. Photos, tracks, artists, albums, videos, blogs, posts, you want it, they got it. Similar to The Hype Machine, Elbo.ws aggregates all things music and puts it into one convenient location for your viewing pleasure. Largehearted Boy: is a music and literature blog designed to keep track of new releases in music and books. Features include music and book reviews, free MP3’s (Daily Downloads), music samples (Try It Before You Buy It), music news, pop culture news, interviews with musicians and authors, weekly music and DVD release lists, 2009 Bonnaroo downloads, and lists of the top albums from previous years. NPR.org/Music: is the fully equipped music website. The site is separated into genres and features up-and-coming concerts by genre as well. Their features include a Song Of The Day, First Listen, A Weekly Jazz Sampler, Workout Music, Interviews, and a wide variety of Music Programs. Pitchfork: is one of the oldest and best blogs for the independent music scene. “Founded in 1995, before Google and Facebook, Pitchfork was there [to provide] a voice with integrity,” claims The Independent. This site is perfect for discovering new music, because they compile the best new tracks into an easily accessible playlist. 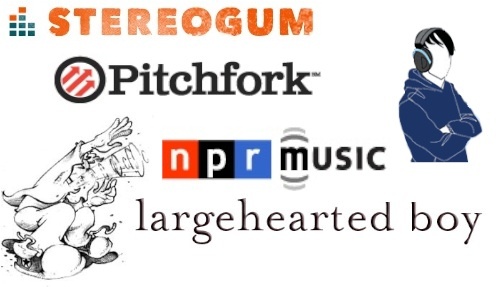 Stereogum: is a great place for general news and tunes. Exceptional coverage and critiques of up-and-coming acts, not to mention the witty, reader commentary also provides a source of good entertainment. Come here for free MP3’s and whole albums of remixed music. Culture Bully (Canada): From mainstream pop to hip hop to indie rock, this blog covers all types of music reviews. Based out of Calgary, Alberta, and well established since 2005, Culture Bully provides an insightful look at everything related to new music. Who The Bloody Hell Are They? (Australia): is a music blog that strictly covers the progression of the Australian and New Zealand music scene. They post new band content alongside free MP3 downloads, to get fans interested in the bands they are promoting. Who The Bloody Hell Are They? also does a great job covering art, concerts, festivals, films, photos, gadgets, and industry news. Music OMH (UK): Based in England, Music OMH has been deemed “accessible and unpretentious,” by The Independent (UK). The music and arts site reviews new albums by everyone from Idlewild to Shakira, as well as providing live reviews and features. Mondomix (World): is the primary site for world music. Mondomix selects music from around the planet for listeners to sample and buy. Each month they spotlight an international artist and each week they feature a free MP3 download from a different artist. This blog provides the perfect medium to browse what is rocking each corner of the planet via continent or music genre. Digital Music News: is a premier industry source for news, information, and analysis. Digital Music News has quickly grown from its humble roots as a small, executive news service to the most widely read information source in the field. Gen-Y Rock Stars: is a music marketing blog and resource for indie musicians. Featuring articles on social media, SEO, startups, internet marketing and commentary on DIY principles, GYRS is a community of new musicians that are looking to use technology to grow their career. MusicThinkTank: is a group blog that anyone can post to, simply by signing up. Typically, the more popular blog posts get moved up to the top of the list, however the blog is intended to bring together key thinkers in the online music business. Solutions for Dreamers: is a blog about the crossroads of entertainment and technology written by the great minds at Oniracom. We post blogs based on what we find interesting in the realm of music, technology, news and the developing the online music business. TinyMixTapes: is an online music and film webzine that focuses primarily on new music and related news. In addition to its reviews, it is noted for its subversive, political, and sometimes surreal news, as well as its mix tapes generator. You Ain’t No Picasso: Features include music reviews, artist interviews, concert reviews, and a sweet concert calendar. 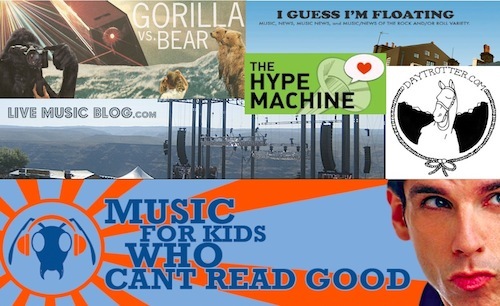 My Old Kentucky Blog: Features include new music reviews and suggestions, concert / festival news and reviews, promotional contests, exclusive interviews and MOKB sessions, a mixtape and playlist section, as well as coverage on general music news and new video releases.